Today's random set is 1974 Smuggler's Hayride, released in 1989. It's one of 3 Castle sets produced that year. It contains 49 pieces and 2 minifigs. It's owned by 1110 Brickset members. If you want to add it to your collection you might find it for sale at BrickLink or eBay. Great memories playing with this set! I would hide the Forestman under the hay to be smuggled by the king’s men so he could get at the king... The hooded peasant was one of my favorite minifigures. I loved the waist pouch on his torso and that hood headpiece. What a cheerful little smuggler. At least he’s smiling whilst he robs people. We can’t have an unhappy crook. What a piece of junk! This thing couldn't possibly make it into the kingdom! 1989... Smugglers hayride... I was slowly getting to my dark ages, being more interested in friends and girls than in my lego castles. But I was still willing to get a little set or two when I saw good ones, and this is a good example of such an attractive one at the time. I loved forest men minifigs. I am still looking for this set, but it is a bit expensive. That looks brilliant. The two minifigs are adorable. I much prefer the classic smiley face! They don't put them enough sets these days. Sets today have such bland names by comparison. I think I'm in the minority here, but I've never been a big fan of the classic smiley faces. They just... lack the *character* of the more specialised ones, to me. I suppose that's part of the point, so that they can be literally anyone without giving a pre-defined personality; but as a kid, it was always a bit of a deal-breaker for me. ^ only thing I don't like about the classic smile is the lack of whites in the eyes. It makes the eyes feel so empty compared to the adorableness of later figs. I do wish we got more "generic" figures these days though. Man this is a cute little set. 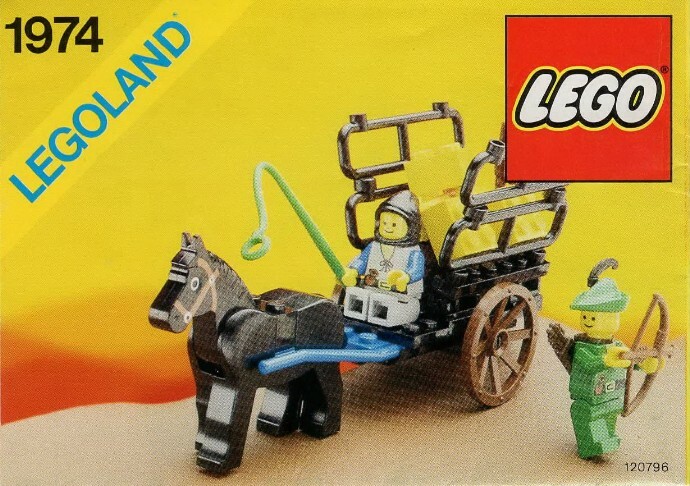 I love horsedrawn carts, heck I got two copies of both 9469 Gandalf Arrives and 9462 The Mummy (the later of which I'm fixing up right now) back in the day. They're just so simple yet effective. All three of the sets in the 1974 multi-pack had fairly unique pieces for the theme. Those 4 black bars didn't show up very often in a Castle set (and brown would have been a better color here, but the black is so much more useful elsewhere...). I miss my childhood. Prime example of what was offered. Maybe the buildnis more simplified. Maybe the classic smiley isn’t for everyone, but I wouldn’t change my childhood for any other Lego time period. I will always prefer the fun I had with these sets. Even looking at the catalogs back then made me happier than I do now, even with all of the amazing sets they have out now. Nostalgia is powerful. I had this when I was a little guy. I loved it, and would have the smuggler perform surprise attacks on the evil lion knights. Especially the dungeon hunters set! In my little world back then, the Forest Men and the Black Falcons were the good guys fighting against the tyrannical Lion Knights/Crusaders who wanted to oppress everybody with their crippling taxes and bullying ways. Great fun! Bring back small sets with horses, be it Castle, or City. Just something with minifig horses again. And I know Friends has some horses in 2019 sets, but those are not the same.